Hi this is Android 4.2 Gesture keyboard apps. Google keyboard is a simple, fast and easy to use for Android users. So Gesture keyboard apps release but now Google launch Gesture typing keyboard it is outstanding app. 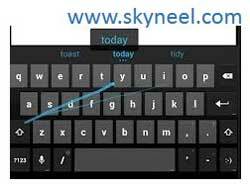 It is a Swype, from which you can easily swipe your finger on the keyboard to input any text in quick way. You can also start normal and voice typing to prepare notes. If you want to install this app on your mobile then you must need minimum 4.0 and greater version of Android. You can easily download this app file from the Google play store. There is no need for root to download this file. After installation of this app you have to go in your mobile phone keyboard setting and active “Android Keyboard” option. Remember one thing very carefully that this app is not work on stock Android phones. If you feel that this apk file is not running properly on your mobile these here is few reasons given below, check them. Either you are running stock on your Android mobile or, run any other software which is linked to stock Android. In that kind of situation, you need root access and move your app on root/system/apps folder via root manger and set permission wr-r-r in this app and reboot your phone. But before start this procedure you must need to have backup of your phone then after follow this procedure. I hope you like this Google Keyboard guide from which you will be able to easily use Google Keyboard on Micromax A110, A116 and ICS, Jelly Bean without any extra efforts. If feel any problem in this guide then please use comment box. Thanks to all.